You’ll begin the process by meeting with your pool contractor to design the project. This is when you get to determine all the details and finishes that you’ve been dreaming about. Once you’ve settled on the design, your contractor will pull permits and obtain engineering approvals. Not the most exciting part of the process, but one that is necessary. This phase can take up to four weeks. When all the paperwork has been satisfied, the real work begins. This entails excavating, placing and leveling the pool, installing the plumbing and filtration system, backfilling around the shell of the pool, and then finally building the coping and patio. This phase of the process can take six to eight weeks depending on how elaborate the design is. This means that from start to finish, it can take up to three months for your backyard retreat to be realized. So, knowing this, when is the best time of year to begin a pool installation? The answer to that question is … it depends. There are two schools of thought on this. One advises beginning in the Fall, and the other Spring. Ultimately, the best time is when you are ready. But here are some factors to consider to help you make that decision. If you want your pool to be ready for the Summer, then at a bare minimum you’ll want to start at the beginning of Spring. This will allow enough time for any delays in paperwork or setbacks in the build. Waiting until spring also means you’ll have new pool products to choose from. 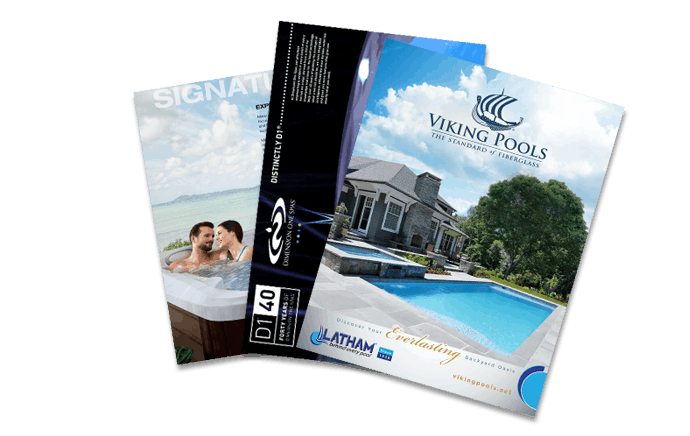 Spring is when most pool manufacturers roll out their new lines. From pumps to skimmers to drains to the pool shell itself, you’ll get to choose from the latest and greatest equipment out there. However, in many climates, Spring brings rain showers, which often delays the installation. A wet muddy mess does not make for a good construction site. And Spring will see many contractors’ schedules beginning to fill up. So, it might be difficult to find someone to do the job. On the other hand, Fall is the off-season for most pool contractors. They’ll be able to devote more time to your project and potentially offer a better deal on prices for materials and labor. At this time of year, pool suppliers also have more of an incentive to lower prices to make room for new, incoming products. But one thing to consider with scheduling your pool installation for the Fall is the downtime between when the project is complete and when the weather has warmed up enough so that you can enjoy your new pool. Unless you live in a climate with warm Spring months, you’ll be staring longingly at your newly installed pool for a while before you’re able to dive in. Whether you decide to have your pool installed during Spring or Fall, start researching and contacting pool builders in the Winter. This way you’ll be able to hit the ground running when the timing is right for you and your family. It’s an individual decision that you’ll have to make. But knowing the advantages to installing during each season will make the decision easier. And no matter when you choose to begin the process, you can’t go wrong — soon you’ll be enjoying splashing around in your new pool for years to come.